Heavy metals are present in low concentration in soil as their natural constituents. However various anthropogenic, industrial activities and agricultural practices have resulted in an increase in the concentration of heavy metals to toxic levels and thus become a limiting factor, affecting the sustainability of agricultural production. Environmental degradation due to increase in heavy metal is a serious issue which requires immediate remediation. To add to the problem large areas of agricultural land with heavy metal pollution are also affected by salinity particularly in arid and semiarid regions. Heavy metals inhibit plant growth and development and may be lethal at high concentrations. Heavy metal toxicity leads to a reduction of assimilation rate, respiration, nutrient uptake and increased oxidative stress. Oxidative stress damages various metabolic pathways which in turn affect the physiological and biochemical processes and cause a reduction in plant growth and productivity. Halophytes are salt-tolerant plants which can grow and reproduce in saline areas where glycophytes cannot survive. Due to special adaptive mechanism present in halophytes, they can be grown in saline soils which are also heavy metal-contaminated. However halophytes are also adversely affected by higher concentration of heavy metals (Cd, Cr, Pb and Ni). 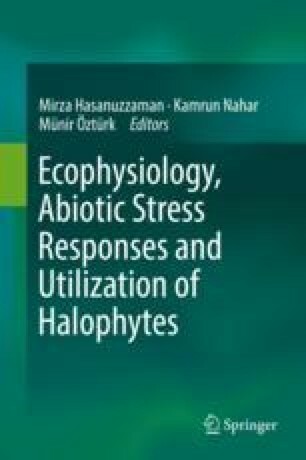 Halophytes have additional advantages as compared to glycophytes like higher tolerance to heavy metal and increased heavy metal uptake. Various studies revealed that halophytic plants are also tolerant to other abiotic stresses like temperature, drought and heavy metals. This may be due to the activated antioxidative system against ROS-induced oxidative stress. So the halophytic plants can be used for phytoremediation purpose in salt and heavy metal-contaminated soil. Among the halophytic flora, species having high biomass and deep root system are most suitable.